Product information "Xpert Triple Cup Glass Suction Lifter"
Make carrying extremely heavy and awkward items a cinch! Easy-to-use and lightweight aluminium bodied triple cup glass sucker for carrying heavy and awkward items up to 155kg in weight. Suction lifters are a favourite tool of the window and conservatory fitting industry as they make the carrying of glass, doors and windows easier and safer. Glass isn’t the only material they can be used, in fact they are also useful for some wood, laminated surfaces and metals, so the usage of them is wide spread – you can even use them to pull out dents from body work. This suction lifter is capable of lifting up to 155kg horizontally and 140kg when fitted on a vertical surface. 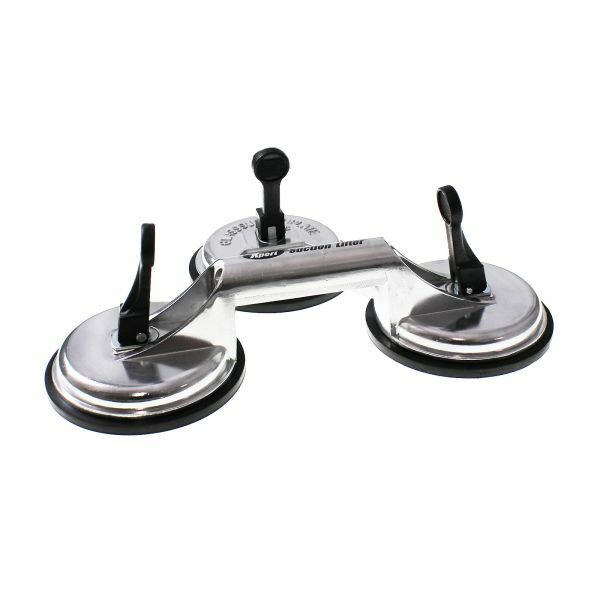 Alternative suction lifters containing more than one suction cup are available for heavier loads. Related links to "Xpert Triple Cup Glass Suction Lifter"
Customer review for "Xpert Triple Cup Glass Suction Lifter"